Jasper Police say that around 4 o’clock yesterday afternoon a woman came to police headquarters and requested to speak to an officer. 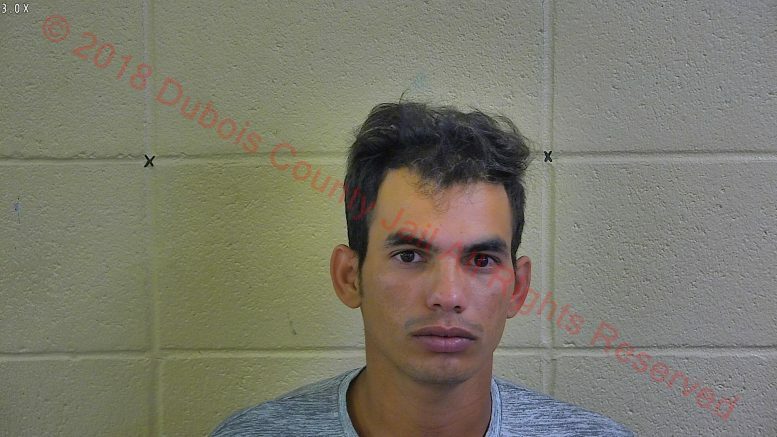 The woman advised that her boyfriend, 24-year old Jose Rodriguez Martinez of Jasper, had been drinking and then headbutted her despite the fact that she is three months pregnant- and that the incident took place in the presence of her juvenile son. The woman then said that Martinez had grabbed a kitchen knife and threatened her with it. Police say in addition Martinez would not let his girlfriend leave during the incident and would not let her use her cell phone to call for help. Martinez was later located by authorities at a relatives house. He was placed under arrest and taken to and booked into the Dubois County Security Center without incident for Domestic Battery, Intimidation, Criminal Confinement and Interfering with the reporting of a crime. Be the first to comment on "MAN WIELDS KNIFE AT PREGNANT GIRLFRIEND"